I’ve been pecking away, weather allowed. I’ve been excavating the pad and walkway outside the sun porch so I can lay brick. I also been pushing Terry to find a mortar mixer for mixing the eps-crete. I don’t nag well and this is something he doesn’t feel invested in, so that small project is going nowhere. I really need to learn to nag. Yesterday I opened paint cans and ground foam and I plan to do more today. I’m trying to stockpile so I can do wall building every other day once the weather improves. We had snow and hail the first week of April followed by lots of rain. So much for the mild northwest weather. I subscribe to the tiny house blog. This morning they had a really nice article on living large in a small space which included a picture of a kitchen that I really like. 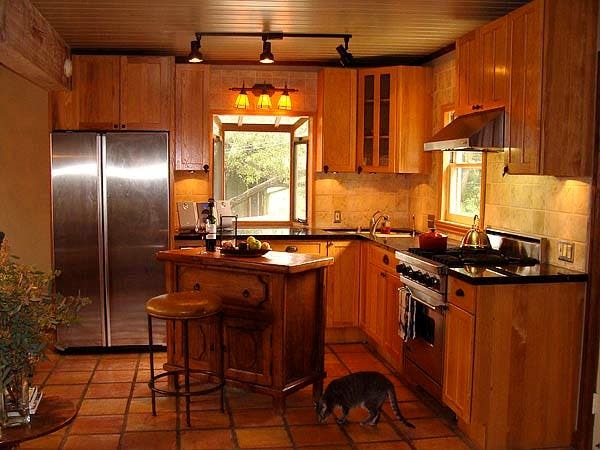 I like the rustic feel and the ideas for maximizing the small space but better lighting is seriously needed. The kitchen has a lot of appeal nevertheless. The layout would rock if the fridge and the stove switched places. Every time the fridge was opened to get something out when preparing food, you’d be on the wrong side of the door. If I were to use this layout, I’d get a fridge with the freezer on the bottom and set the door to open in the correct direction for flow. The sideboard also needs a counter that sticks out over the stool. If you sit there to eat, there’s nowhere to put your knees. There should be crown molding or fascia to seal off the space above the cabinets. That space is a total dust catcher that would be impossible to keep clean without long handled implements. The gap doesn’t add a thing to the design. There’s a lot of positive stuff in this kitchen, but with many kitchens, there’s a break between the designer’s vision and best function. This entry was posted in Building, Construction, Design, Planning. Bookmark the permalink.